The Pew Research Center recently reported that 15% of American adults are not internet users and that there were a number of demographic groups of adults who were particularly unlikely to be online. That number surprised some and became part of policy discussion on Capitol Hill about broadband adoption issues. 1 Many of them are “secondary internet users”: 44% of offline adults have asked a friend or family member to look something up or complete a task on the internet for them. 2 Notable numbers of them live in homes with internet connections: 23% of offline adults live in a household where someone else uses the internet at home, a proportion that has remained relatively steady for over a decade. 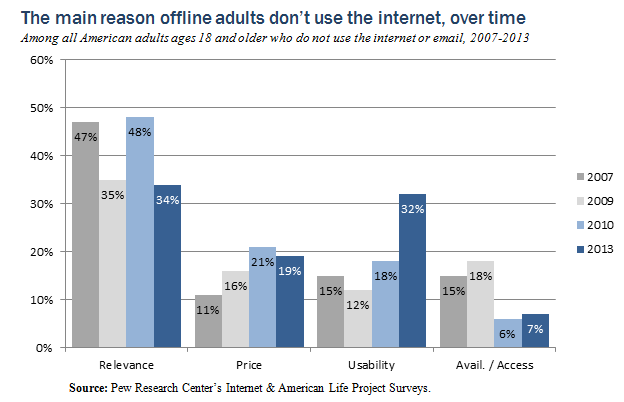 3 A share of them used to be online, but have since dropped off: 14% of offline adults say that they once used to use the internet, but have since stopped for some reason. 4 Age is one of the strongest factors related to non-internet use, followed by education and income. Over half of seniors who did not attend college or live in households earning less than $50,000 per year are offline. 5 A share of non-internet users live in cities: among urban residents, 14% are offline. 6 A rising share of them cite “usability” issues as their main barrier: 32% now say they don’t use the internet because they say it is not easy for them to use. These non-users say it is difficult or frustrating to go online, they are physically unable, or they are worried about other issues such as spam, spyware and hackers. This figure is considerably higher than in earlier surveys. In 2009 when we asked that same question, only 12% of offline Americans cited usability issues as a reason for not being online. 7 Most of them say they would need help going online: 63% of offline Americans say they would need someone to help them go online if they choose to use the internet in the future.